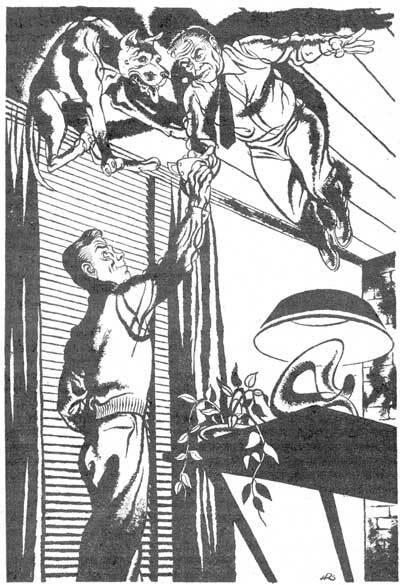 At fifty, a man should be too old to go around flying off the handle, or wandering around on the ceiling. But what could a man do when he had a son who insisted on being a genius? For a man my age, the middle 50’s, life has a number of compensations. There’re children—we have two; there’s a good wife, and I’m certainly blessed in that respect with Mary; and there’s the joy of coming home, slipping on my slippers, having a good dinner, then relaxing with coffee and a pipe. There’s no compensation for being plastered to the ceiling. But, more of that later. The after dinner coffee with a dash of rum in it, tasted very good, and so did the pipe. The meal was satisfying too. Thank goodness for that meal, because it was the last decent one I’ve had for quite some time. Oh, I’ve eaten all right, but you’d have to stretch your imagination to call any of it a meal. Can you picture eating food that keeps trying to move away from your face? That is, if you can keep the plate from moving away too? As I say, Mary and I had just finished dinner, when Jim, our 22-year-old gangly son, who’s home on summer vacation from MIT, called me. “Sure,” I said, heading down the hall to his combination laboratory, dark room, aviary, and just plain bedroom. Fortunately it was a big room so there was space for a bed in addition to all the stuff a boy can collect who becomes enamored of science while in High School, and who consummates the wedding with studying electronics in college. “Just want to show you something,” he said, pointing to the floor. He was bent over looking intently at what seemed to be a sheet of that fluorescent plastic that’s used for signs. It was lying on the floor, was about two feet square, and was glowing a dim pink. Whether from light within itself, or from the desk lamp, I couldn’t tell. “I don’t really know, Dad, but watch what happens.” So saying, he picked up a glove from the desk, tossed it onto the plastic plate. I should say he tossed it atthe plate, because it didn’t land, but rose fast, straight up! I watched it hit the ceiling with a splat! Where it stuck. It was then I noticed several other things all plastered to the panelling too; the mate to the glove, a package of cigarettes, a cigarette lighter and a golf ball or two. Well, I had learned years ago in the Prestidigitation Age, or, “You too can amaze your friends with feats of Magic” that quite often Jim would go to great lengths to mystify anybody handy. I wasn’t too impressed. While Jim was talking, I had been looking the rig over. It consisted of the plastic plate lying on the floor, with two sets of wires running into it, and out of it. In turn, these four wires led into what I took to be a transformer of some sort. Such as you’d use for a toy electric train. It had roughly calibrated dials on the top of it. A regular AC line from the transformer was plugged into the wall socket. “Well, yes and no,” Jim said. “Look at it this way Pop; suppose this is not a fluke and I’m able to duplicate this thing. Suppose I’m able to take this transformer and duplicate it too. All on a larger scale. How could it be used to good advantage? It’d probably do away with elevators in most cases, except you’d have to walk down. But then, by making the field weaker, maybe I could fix it so’s you’d float down. Then too, I wonder if it can be applied to aircraft of any kind … I suppose you could take it and …” his eyes were shining. Well, it dawned on me then what he was talking about. Duchess is our nine-months-old Great Dane pup. Weighs about a hundred pounds. So, pulling on bathrobe and slippers, I went down stairs, and hurried into Jim’s room. Sure enough, plastered on the ceiling and looking mighty scared and sick and sheepish was Duchess. When I came in she wagged a feeble tail at me and squirmed a bit. Mary, Johnny and Jim were all standing looking at her. Duchess was apparently unhurt, so I walked over and reached up to coax her down. Just then Jim shouted, “Dad! Don’t do…!” And my head hit the ceiling! Like a fool I had walked right over the plastic plate! As soon as I could get my eyes to focus properly, I shut them again quickly. I was lying, (lying!) next to Duchess, on the ceiling, and she was thrashing me in the face with her tail. As soon as I pushed her around so my face was out of range I could see the dumbfounded looks on the rest of the family. By this time, Johnny was lying on the floor about to bust a gusset laughing at his father and long-legged Duchess sprawled on the ceiling, and even Jim, who is always rather straight-faced, was beginning to grin a little around the edges. Mary still seemed convinced that Duchess and I had done it on purpose. Jim finally gathered his wits enough to start pushing the bed under us. Between the three of them they managed to bypass the wires to the plastic plate and set the bed over it. I noticed that it bucked a little as the edge went over the plate, but I didn’t get time to see much because no sooner had the bed been pushed over it than the whole thing with the exception of the frame, rose straight up and smothered the dog and me very effectively! After the first moment of panic, consisting of flailing arms, legs, muffled barks and curses, I was able to shove the bedding aside so we could breathe again. I had just started to yell at Jim to turn the thing off and stand aside, when that’s just what he did. I clutched at Duchess, hoping to break both our falls I guess, but nothing happened! I looked at Jim, and he was looking at the plug in his hand. There was a dazed look on his face, and I’m sure there was one on mine too. Duchess just licked my face and wagged her tail. For a space of about two breaths no one spoke, then all started at once…. “Jim, you pull out that plug right now and get your father down from there!” That was Mary. “Don’t just stand there like a dope … turn that damn thing off!” That was me. “Jimmy, where’s your camera? I want to get a picture of this!” That was Johnny. Duchess just whined, and wagged her tail apologetically. “I unplugged it, Dad … I don’t know why you’re still up there.” He shook his head. So Jim eased up to within about a foot of the plate, grabbed the wires and started pulling. I had no sensation at all. We just stuck there. Even with the plate out in the hall! “What do you mean by ‘charge’?” I asked. “Well, not knowing what kind of field I generated with that plate, I couldn’t tell you offhand, but it is probably something like this; you see, apparently what I did was not cut gravity off exactly, but changed the normal electrical charge in whatever object came into the field. Seems to me if I had cut gravity with the plate, you would have fallen when I turned it off. As it is, you’re still there,” he added rather unnecessarily. And Jim, as his teen-age friends used to say, wasn’t just whistling Dixie. We were definitely, unquestionably still there. About this time I became aware of a pain in the small of my back. For a man who is pushing 60, I’m in pretty good shape except for my sacroiliac. Just my luck, I thought. Here I am, plastered to the ceiling, and that thing has to start acting up. In moving a bit though, I heard a scraping sound and found I had more than one pain in my back. Feeling carefully under me, I found that it wasn’t the sacroiliac at all, but a cigarette lighter, two gloves, a pack of cigarettes, and two golf balls. I tried to toss the balls down to the floor and all they did was go almost down then curve right back up and bounce on the ceiling, where they settled. I tried the same thing with the gloves and back they came too. So I lit one of the cigarettes, even without my morning coffee. Mary had been silent for awhile, but apparently she had the same thought. “Ralph, aren’t you coming down for breakfast?” she asked, pleadingly. Jim left for the phone, and shortly Mary came in with a steaming tray of food. That’s where the fun began. About the food: Mary was right under us with the tray. She put it down, picked up a bowl of oatmeal and started to hand it to me. She couldn’t reach high enough and I couldn’t reach down far enough. The thought crossed my mind, “why not stand up?” Well, I tried it, Brother! What a sensation! As I began gathering my legs under me, the idea of being on a pine floor increased. Increased until I made the mistake of looking out the window! It’s just plain impossible to describe, but try to imagine how it would look right now, if you looked out your window … at the top (to you) is the ground, and at the bottom? Nothing! Just nothing, but blue sky. The vertigo was pretty bad and I flopped back down, or rather “up” and tried to regain my equilibrium. As soon as I caught my breath, I said, “Well, yes and no, honey. Could you or Johnny get a ladder? I think that might do it.” I could stay lying down that way. Johnny brought in the short stepladder, so without standing “up” I at least got my hands on the food. Hands is about all. Here’s a picture for you…. Flat on your back; an open dish of hot oatmeal open side to, coming right at you. When you grab it you have to reach around behind it to keep it from falling. You get it right up to your face, take the spoon and start to take a bite. How do you do it? I don’t know either. I gave up oatmeal right then and there. Johnny, and again, bless his little heart, had the idea that saved us. “Hey, Dad, why don’t you try a banana?” It worked! In fact, most any food that was in a chunk could be eaten. Difficult, but it could be done. The big problem then was liquid, and again Johnny came to my rescue with some fountain straws from the corner drugstore. For Duchess it was easy. She just lapped. About the time we finished the battle of breakfast, Jim came back with word from Professor Jordan. “When will he get here?” Mary asked. “Then he’ll be here this afternoon?” I asked. Days? Holy Smoke! I wondered how long it would take? Already, I was getting tired of lying down. Hey, wait a minute! What about the springs, mattress and covers stuck up here with me? There indeed was a thought. Pushing Duchess aside and getting licked in the face once again for my trouble, I reached over and got hold of the mattress. In doing so I had to roll over partially. I really got the sensation then of being on a pine board floor. So much so in fact, that I rolled clear over onto my hands and knees. It wasn’t so bad after all! Just like being on a regular floor, reaching for a mattress and covers. Really had to keep my eyes away from that window though! I finally got the bed straightened out and got comfortable. Duchess, no doubt figuring this was a rather special occasion, proceeded to ease herself in bed with me. At that point I didn’t care too much so I let her stay. It was a funny thing but she didn’t seem to have much trouble standing up at all. In fact, she seemed perfectly happy with the whole arrangement, but every-time I glanced at that dormer window and pictured vast reaches of blue nothing, my stomach turned over a little. Guess I must have dozed off, because the next thing I remember was Johnny standing on the ladder, poking me with a tennis racquet. Johnny figured, and oddly enough it’s no trick to brush your teeth (I’m lucky to still have my own) upside down. It’s much the same as when you do it normally … bent over the lavatory. As for shaving, well I never cared much for them, but I used Jim’s electric razor and that was taken care of. No shower though. Not even Johnny could figure that one out. Mary came in with sandwiches and coffee, and with straws it turned out all right. Duchess did her usual lapping. There wasn’t anything else to do but wait, so Johnny brought me the morning paper. Let me tell you, that’s no snap, trying to read a paper that’s continually trying to pull away from you. My arms got awfully tired after awhile so I gave that up. Noticing it was rather stuffy, I asked Johnny to lower the upper sash of the dormer so the air could circulate a bit, and as it became more comfortable, I must have dropped off to sleep again. The next thing I knew I was awakened rather forcibly by loud screams and yells from the garden just outside the window. When I got my wits together and looked, the first thing I noticed was that Duchess was nowhere around. About that time, Johnny burst into the room, tears streaming down his face, and crying as though his heart would break. Close on his heels was Mary, also crying, and Jim was bringing up the rear. “What in the world’s the matter?” I asked. “She just flew right up in the air!” Johnny added. “Yes, you’d go up too, Dad,” Jim added. Clutching tightly to the mattress, I assured them I wouldn’t go near the window, or the door either, for that matter. Just the thought of that poor dog sailing up in the air made me sick in the pit of my stomach. “How high will she go, Jim?” I asked. “Gee, I don’t know, Dad. But I think she’ll just keep right on going, clear up out of the air.” Jim had a hard time keeping a sob out of his voice too. Jim told him the whole story of how Duchess and I got caught, then went into great detail about the plastic plate, the kinds of metal he had used, and the different settings on the transformer. He finished by telling how Duchess had sailed off into space. The professor walked out in the hall, reached in his pocket for a handkerchief, tossed it over the plate. It rose! Straight up, and stuck to the ceiling! Mary and Johnny, who were watching in silence, both spoke up to say that neither of them had. Jim reached down and picked up the AC line. Sure enough, itwasn’t plugged in! All this time of course, Mary and Johnny had been standing more or less open-mouthed, listening, and I, from my vantage point high on the ceiling, had been taking it all in too. Jim thought a moment, snapped his fingers and said, “By golly, I believe I’ve got another piece of that plastic around here somewhere. I made it up at school and had to cut a little piece off so I could get it in my suitcase. I’ll see if I can find it.” And stepping gingerly around the plate in the hall he came back into the room and started rummaging around in his luggage. Jim and the professor very carefully disconnected the transformer from the plate in the hall, made sure the dial settings were the same, then hooked up the new plate. It was a lot smaller than the first one, being only about six inches wide and two feet long. “I wonder if shape has anything to do with it?” the professor mused. Professor Jordan took the knife, got up close to the plate, gave it a toss, and plunk! It flew over the plate and went straight to the ceiling! And stuck! “Well, thank goodness, we know it’s the present combination of voltage and frequency, and not a series of changes,” Jim said, relieved. Mary came in then with some more sandwiches and coffee, and I went through the same routine with the straw, only this time I got choked. Thank Heaven I did! That sounds funny, but while I was coughing and sputtering, spewing coffee all over the place, Jim had walked over so that he was right under me. He stood for a moment watching me sputter, then let out a whoop and hollered. Mary was shocked. I was still listening between sputters. “Yes, Johnny, and run it through the window so it’ll come inside the room,” Jim explained, quickly. “Will someone unhook the screen?” Johnny was outside. Splat! On it came, and it’s been on and off and on and off for, let me see, this must be the third day now. And I don’t mind telling you I’m not going to need a bath for at least two months when I get down. When I get down! Do you know where I am right now? I’m about two feet from the ceiling, which puts me still ten feet from the floor … hanging there in the air like the assistant to an Indian fakir! Only this is no trick. Oh, it’s not so bad now; I’m wearing swimming trunks and Jim and Professor Jordan with the assistance of Johnny and Mary, rigged a sort of trough arrangement to carry the ‘charged’ water out of the window and up into the sky. The water that didn’t pick up a charge and fell to the floor is being pumped out the window with a hand pump. Oh, yes, they had to dam up the doorway to keep the rest of the house from being inundated. And I shudder every time I think how much damage has been done to Jim’s bedroom. I’m coming down though, slowly, and Professor Jordan has it figured that at the present rate it’s going to take five to six more days. I don’t know how he came to that conclusion, but I sure hope he’s right and hasn’t underestimated. The constant soaking has my skin looking like damp corduroy. All over too. What about the transformer and plate? Well, I believe Professor Jordan is going to take a leave of absence and he and Jim are going to do some full time research on the device, whatever it is. They both think it has many possibilities. So do I, but I’m going to keep my feet on the ground. If they ever get there! As far as I know, this is all that Kirby Brooks is known for. Please let me know if I’m wrong! I hadn’t heard of him before stumbling across this story today. ← The Friday Film – Hail, Caesar!